A new Maurice Wilkins Centre study is bringing together researchers from across the country to investigate the genetic factors that predispose some New Zealanders to a greater risk of obesity or diabetes. The study is already challenging popular opinions about New Zealand’s rising obesity rates. You are what you eat, right? Not if you ask Professor Peter Shepherd, Deputy Director of the Maurice Wilkins Centre and one of four co-directors of a new $1 million study analysing up to 500 genes suspected of affecting individuals’ appetite and/or the way theycontrol their energy metabolism. “Popular opinion frequently cites poor diet or lack of exercise as the major cause of obesity,” says Peter, but he is quick to point out that while this is in principle true, it doesn’t explain why individuals are affected in different ways by similar degrees of bad diet and lack of exercise. Peter is working with fellow Maurice Wilkins Centre investigators Dr Rinki Murphy, Professors Dave Grattan and Tony Merriman, and Dr Donia McCartney-Coxon on a landmark programme to study those genes in a New Zealand context. Once results are in, MWC researchers will use their combined skills to determine how the information can be used to develop targeted therapeutic strategies or rationally designed prevention programmes. By bringing together geneticists, clinicians, neuroscientists and biochemists from across the country, the Maurice Wilkins Centre study is also breaking down institutional and disciplinary barriers to deliver exciting new approaches to one of New Zealand’s biggest health issues. 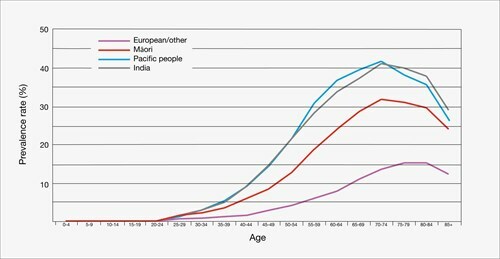 Image: Type-2 diabetes prevalence rates in New Zealand 2010: graph demonstrates a higher prevalence of Type-2 diabetes in older people and the differences in prevalence of Type-2 diabetes between differenct ethnic populations in New Zealand. Source: New Zealand Virtual Diabetes Registry data.